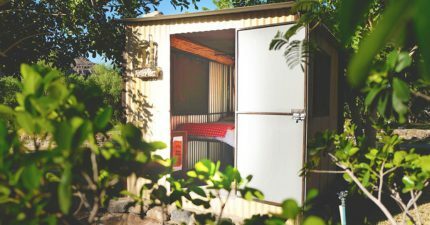 The Growcery Camp – Vioolsdrift Campsites. We offer public and private Vioolsdrift campsites at The Growcery Camp. There are two large open campsites at the Growcery Camp. 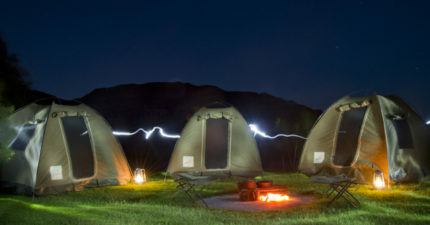 These camps are suitable for travellers and visitors that don’t mind sharing a campsite. There is no Campsite fee and only camping fees that apply to these two sites. The Public Campsites are well positioned and has a standard washing basin and BBQ facility. These camps have trees and grass campsites. The Public campsites are near the ablution facilities and the showers. All our camps have recycled waste bins, and we would appreciate if you can select the correct waste bin for our recycling project. All our travellers and campers need to check in on arrival with your confirmation vouchers. You will receive an organic bucket after checking in at the Growcery. It will be highly appreciated if you can return this natural bucket daily to reception. This helps with our compost project at camp. We do offer freshly cooked meals on a daily basis. We recommend that you book your dinner before 12:00 pm in the afternoons. All our meals are freshly prepared, and we need preparation time to offer a healthy fresh meal. The Growcery provides a variety of adventure activities, and you are welcome to select your adventures at the reception. There are daily excursions and make sure not miss these great adventures from the camp. We have a designated fishing area. However, all fishing is on a tag and release basis. We don’t allow using live caught fish as bait. The largemouth yellow fish has declining numbers, and we would like to keep them from dropping even more. We do welcome all public campsite visitors at the Growcery. The significant advantage of public campsites, besides the reduced rate, is the opportunity to meet other travellers. We can arrange to open the gates for late arrival. Ages 1-5 yrs will stay for free at campsites and accommodations. Children need to be accompanied by adults near the river.